I cut my finger today while I was doing dishes. I dropped a glass vase in the sink. Since I have the reflexes of an awesome ninja-catwoman hybrid, I am usually able to catch things that fell, but today, when I tried, I was just a millisecond too late and my hand and the vase became one! 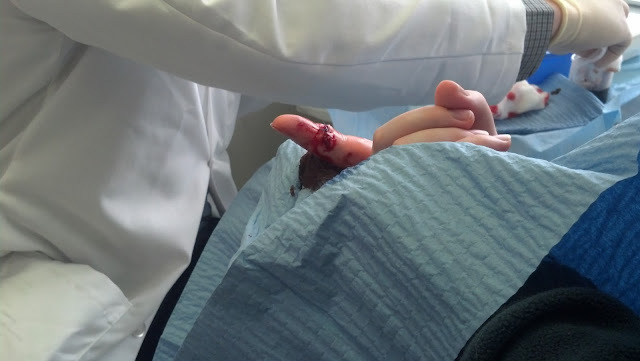 As a kid, you wonder how you'll know if a cut needs stitches--it turns out you just know. There was a lot of blood. Blood on the sink, blood on the vase, blood on the floor. I grabbed a paper towel and put pressure on it. Some very kind friends (including our G.P.) were willing to help us out so I went into my doctor's office instead of having to go to the E.R. I had to keep pressure on the cut and have it elevated. I did so for about an hour--but the bleeding still didn't stop! My Cut. You can see the hanging flap at the bottom. 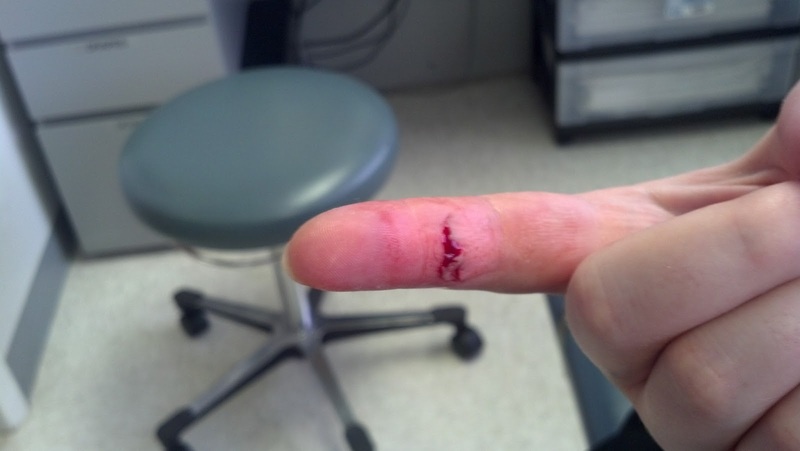 My doc cut away that flap and used scissors to even out the jagged edges so that my skin would close more smoothly. 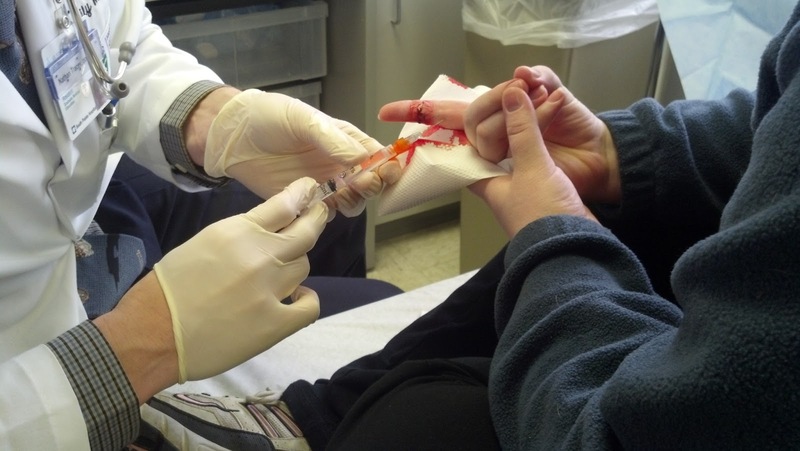 Next, he washed it out with a lot of saline solution. It stung a little. Also there was a ton of blood running down the back of my hand--so much that I thought I maybe had another cut I didn't notice before. All clean? It had been washed thoroughly--even rubbed down with alcohol--but it would NOT stop bleeding. At this point, the depth of the cut became apparent. At the top of the cut you can see that the subcutaneous fat is sticking out--there was some at the bottom of the cut, too. There was a medical student who was helping. He didn't get the chance to do much except switch out my super bloody paper towels. Now it got serious. 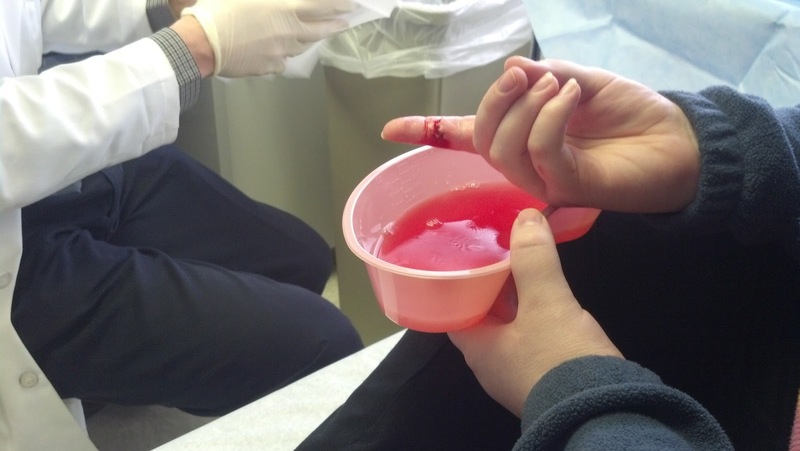 The doc told me that the next part would hurt a lot and that I needed to hold my finger really still for the Lidocaine. Surprisingly up until this point, it really didn't hurt that much. It felt like a cut, but even though it looks horrific I wasn't in agony or anything. He wasn't kidding when he said it would hurt. 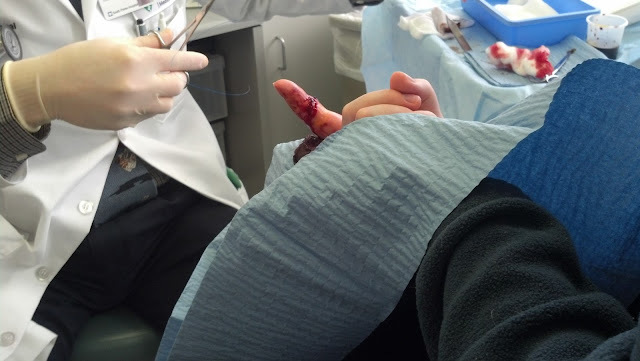 He stuck the needle in like a quarter inch (which is pretty deep for a finger) and started to fill it up with Lidocaine. The pain was intense for the first second or two of the shot and then there was just the very uncomfortable sensation of your finger being inflated. To fully numb the site he gave me about five of these shots--some of which he stuck in a half inch or so. The worst part was feeling the skin on my knuckle expand as my finger got fatter and fatter. I was more agitated by that than by the pain from the shot. It's me and my doctor. 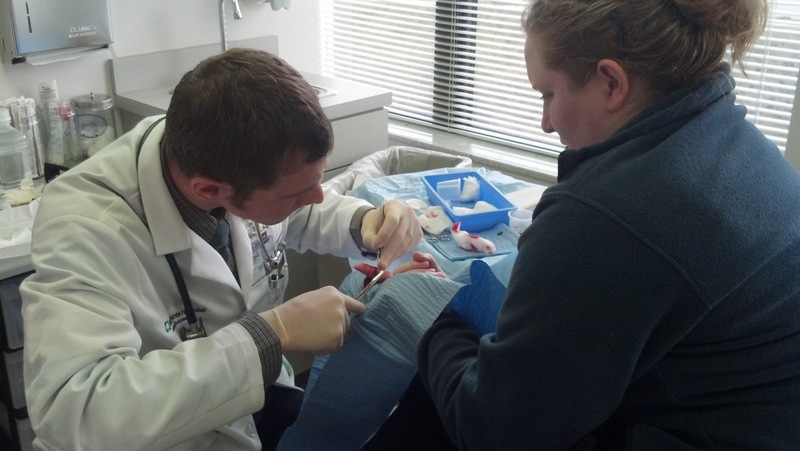 The ickiest part of this experience for me was just before this, when he cut off pieces of my skin around the cut. Right now he's starting stitches. He started with a big one in the middle of the cut that he tied off four times. Then he made a stitch on either side. My cut was still bleeding the whole time. 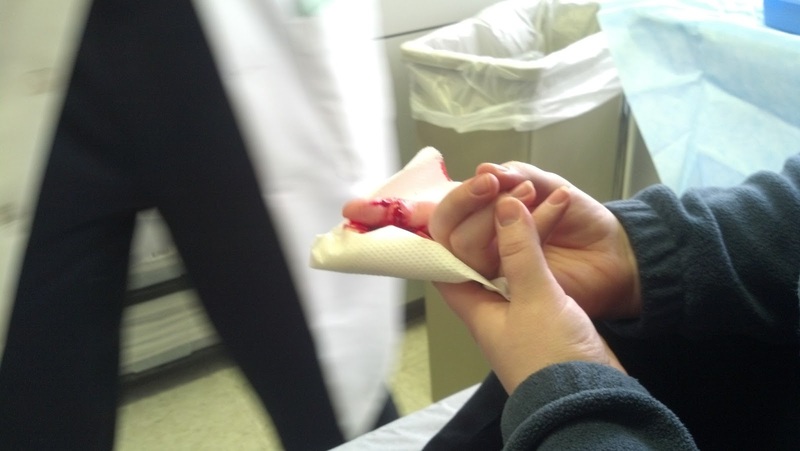 Even with three stitches in, I was still bleeding. 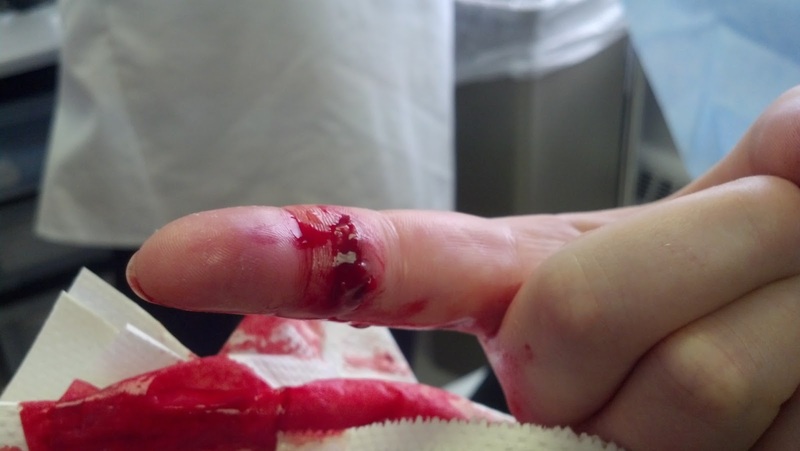 Your finger has two little arteries that go up the sides and I swear it was like a teeny, oozing arterial spurt. I could see it coming out with my pulse. This is what I look like when I'm carefully listening to instructions. No boot camp til Monday. Check. If it starts heavily bleeding or really hurts, call the office because that's a sign of infection. Check. Brandon should take you to brunch. Check. You'll notice I'm applying pressure still, even after being all bandaged up because it STILL hasn't stopped bleeding. Anyway, I definitely learned my lesson and will not be doing dishes again for a long, long time. Brandon and I went to the Inn on Coventry for an awesome brunch (I specifically asked my doc to recommend it to Brandon as part of my medical treatment). The bleeding finally stopped (it started again just a tiny bit when I hugged Greta too enthusiastically). 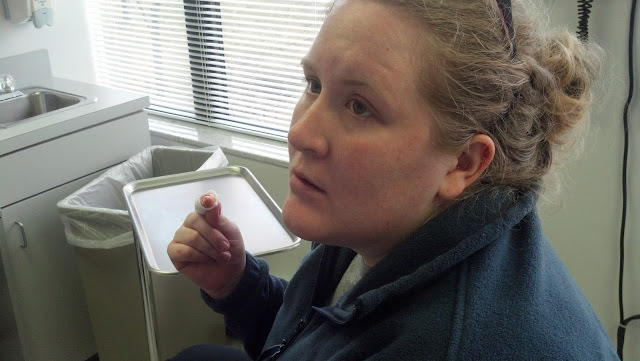 In the hour or two after my stitches, the lidocaine wore off and it started to feel like my skin had been cut, washed, poked with needles, cut again and had four nylon threads tied through it, but I imagine that's only to be expected. I took some ibuprofen (I know, bleeding risk, but if I hadn't bled to death out of the cut by then, a few more drops couldn't hurt) and felt fine. Now it generally only hurts if I flex my finger too much. Special thanks to my very kind, patient doctor and his sweet wife and as always, to my wonderful supporter/dynamite cameraman Brandon. And to med student Nick who tried to clean off my bloodstained hands with an alcohol wipe and was mostly unsuccessful. I mocked him until I tried to do it myself later--suddenly I understand where Lady Macbeth was coming from. BAM! Surgery and Shakespeare all in one day!